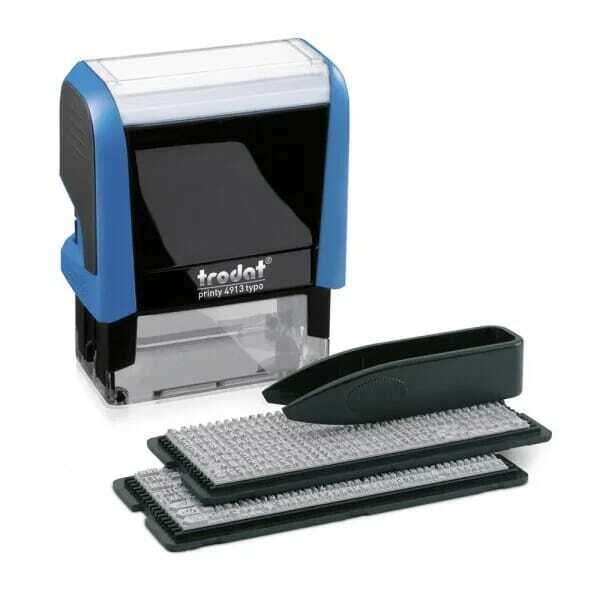 Personalise and create your own D-I-Y self-inking rubber stamp with the Trodat Printy Typo 4.0. The 4913 allows you to cost effectively create your own messages quickly and easily. Each kit contains a self-inking stamp, a selection of symbols, multiple letters, letters, text plate, tweezers for setting your message and a replacement pad. All of the characters that are supplied as part of the pack are reusable, so can be used over and over creating new impressions each time. Once the correct impression has been made and set, the 4911 will create an impression size measuring 58 x 22 mm - this can accommodate a maximum of 5 lines of your personalised text. As with all Printy stamps the 4913 is supplied with a black replacement pad. Blue, green, red and violet ink pads are also available by purchasing a 6/4913 replacement pad. Customer evaluation for "Trodat Printy 4.0 Typo 4913 - up to 5 lines of text"
Just bought this product to stamp subject specific target sentance statements into sketchbooks when marking. Enough space to write a concise sentence, and date. Plenty of individual letters and numbers so can create very complicated message. Clear stamp, and smooth easy stamping action with helpful tweezers to set the type. Would definitely recommend this product.